804790434 -Americans are slowly waking up to the dire effects of racial profiling, police brutality, and mass incarceration, especially in disadvantaged neighborhoods and communities of color. The criminal courts are the crucial gateway between police action on the street and the processing of primarily black and Latino defendants into jails and prisons. And yet the courts, often portrayed as sacred, impartial institutions, have remained shrouded in secrecy, with the majority of Americans kept in the dark about how they function internally. Crook County bursts open the courthouse doors and enters the hallways, courtrooms, judges’ chambers, and attorneys’ offices to reveal a world of punishment determined by race, not offense. Nicole Gonzalez Van Cleve spent ten years working in and investigating the largest criminal courthouse in the country, Chicago–Cook County, and based on over 1,000 hours of observation, she takes readers inside our so-called halls of justice to witness the types of everyday racial abuses that fester within the courts, often in plain sight. We watch white courtroom professionals classify and deliberate on the fates of mostly black and Latino defendants while racial abuse and due process violations are encouraged and even seen as justified. Judges fall asleep on the bench. Prosecutors hang out like frat boys in the judges’ chambers while the fates of defendants hang in the balance. Public defenders make choices about which defendants they will try to “save” and which they will sacrifice. Sheriff’s officers cruelly mock and abuse defendants’ family members. 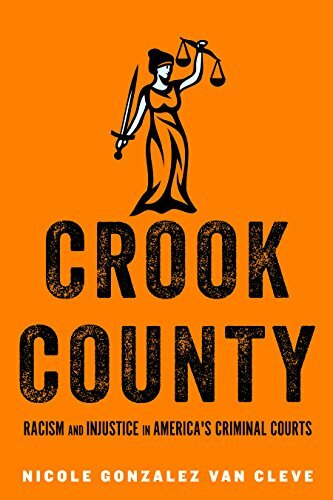 Crook County‘s powerful and at times devastating narratives reveal startling truths about a legal culture steeped in racial abuse. Defendants find themselves thrust into a pernicious legal world where courtroom actors live and breathe racism while simultaneously committing themselves to a colorblind ideal. Gonzalez Van Cleve urges all citizens to take a closer look at the way we do justice in America and to hold our arbiters of justice accountable to the highest standards of equality.